When you create a dynamic website site with a program like WordPress, all of your content is stored in a database and pages are generated as they are requested by the server. If you’ve built your website with a program like Dreamweaver, GoLive, or FrontPage, you’ve probably built a ‘static site,’ meaning every page in the site is a separate HTML document. Here’s an example to help you appreciate some of the differences…. Imagine you have a Web site where you sell 50 different kinds of candy – 10 different kinds of candy bars, 10 flavors of jellybeans, etc. How many web pages would you need to create? When you store all of your goodies (the photos, headlines, product descriptions, posts, etc.) that you display on your web pages in a database using a program like WordPress, you gain the ability to create web pages dynamically — as they are served to the visitor of your site. 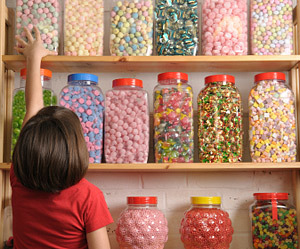 That means you take all that information about your 50 different types of candy and create as many different pages as you like by simply rearranging the different elements stored in the database. And you can make it fast and easy to search across all of your content at once in many different ways. Another advantage is that if you change the name of a candy bar, you simply change the name once in the database, and it’s automatically changed on all the pages created from that entry in the database. Dynamic sites also enable you to create links between pages with related information — automatically — so visitors can drill down to find the details they want more easily. For example, you can set up one page that is designed to display all the kinds of candy you sell, but specify that only ten items should appear on each page. With WordPress you can create pages like that automatically — generating as many pages as needed to display all your products (at ten per page, or 20 per page), and linking each page to the next. If you add more products to the database, the system generates more pages as needed, also automatically. Using Dreamweaver templates on a static web site (covered in our Dreamweaver tutorials) will get you some of the same advantages you’d get from a dynamic site — such as global updates to common parts of a page — but you still have to go through and create the unique parts of every one of those 657 distinct pages, and then upload all of them to your Web server. (If your site is less than 50 or 100 pages, Dreamweaver templates may be fine, but once you get to a site with more than 500 pages, it’s definitely time to graduate to using a database to manage your content. A dynamic site saves time because you don’t have to create individual pages for every product or for every different type of product listing. With a dynamic site, you often have to invest a little more time up front getting the site set up, but if you’re working on a site that’s more than 100 pages or so, the dynamic approach is almost certainly going to be more efficient in the long run. When you compare the two types of site development options, dynamic Web sites clearly offer advantages to site owners who have a lot of data, such as items for sale, or articles with sections and subsections, that you want to present to the world in a consistent format. Learn more about the differences between creating a web site with Dreamweaver and a blog with WordPress.